Designed for usage in the most extreme environments, the VBOX-3120 is capable of operation at -40°C to 70°C and can withstand dramatic levels of shock and vibration up to 2.5G. Based on Intel's energy-efficient Haswell Core i3-4010U Processor, VBOX-3120 is an innovative in-vehicle computer which is suitable for a wide variety of applications within bus digital signage, bus surveillance, trucks, trains and numerous other vehicles. The VBOX-3120, measuring only 182 x 167.6 x 52 mm, supports an industrial temperature range of -40°C to 70°C to meet tough requirements in space-critical and harsh environment applications, and is designed as the most exciting fantasy product for vehicle applications. To facilitate mobile communication and navigation, the VBOX-3120 has integrated LTE, UMTS, GSM, GPRS, WLAN and GPS with Dead reckoning. The unit features vehicle power ignition that enables it to adapt to various power supply conditions within transportation environments. For increased flexibility, the VBOX-3120 has a wide range power input (9-36V) and an optional internal smart battery backup for uninterrupted power support. 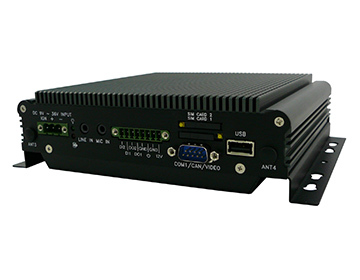 For in-vehicle passenger infotainment and digital signage applications, the VBOX-3120 supports a multitude of display interface connections such as HDMI and DVI-I. Other features include supporting one RS-232 ports (COM1 with RS-232/422/485) output, one CAN BUS and three Mini-card slot for WLAN/4G LTE/3G modules. The VBOX-3120 features ultra slim and compact, heat-prevention design, -40°C to 70°C extended temperature range, rich I/O ports, easy installation & maintenance, and automatics recovery short circuit protection. With these superior features, the VBOX-3120 is suitable to be installed in limited space for vehicle system applications. ©2009-2019 SINTRONES TECHNOLOGY CORP. ALL RIGHTS RESERVED.